We have heard rumors of the impending launch of a 7.85-inch "iPad Mini" for some time now, but none of those rumors have received as much attention as a recent report from iMore. Let's have a look at the veracity of these claims, specifically related to the rumored $200-$250 price, and the potential impact it could have on Apple's stock and the tablet market. iMore, which has been accurate with its reports before, has claimed that launch of the iPad Mini is on track for October 2012, at a price point of $200-$250. This particular iPad Mini is said to be identical to the new 9.7-inch iPad, but scaled down to 7.85 inches and with 8 GB storage. For the purpose of this article, I have assumed that the rumors of the launch of the iPad Mini are true. It is entirely possible, even likely, that they are not. So please do not construe this as an affirmation of those rumors. The point of this article is to analyse the potential price point an iPad Mini could hit, and at its impact on Apple's stock and the tablet market. So let's dive in. In order to estimate the price the iPad Mini could launch at, we first need to get an idea about what it would cost to manufacture that product. Pricing is usually a function of demand and not cost, but in this case, since we are talking about a price point as low as $200, the gross margin expectation from Apple's investors becomes a constraint. Taking a look at iSuppli's estimates for the "Bill of Materials" (BOM) for the Kindle Fire, the new iPad and the iPad 2 is a good starting point. BOM is essentially a list of components that are required to manufacture a product and their costs. Once we add manufacturing expenses to this cost, we have an estimate of how much it costs to manufacture this product and hence, in conjunction with the retail price of the product, we have an idea of the gross margins. Keep in mind, gross margins do not include advertising & marketing expenses, which are deducted from gross margin to arrive at an operating margin. I've split the BOM projection of the iPad Mini into two possibilities. "High-End" assumes the product is exactly as describes by iMore, i.e. essentially a scaled down version of the new iPad. "Low End" takes into account all the other rumors we've heard about the iPad Mini, i.e. a less powerful device for the lower end market. Both of these assume that the iPad Mini is a WiFi-only device. Now, let me explain how I've arrived at these projections. NAND Flash Memory - iSuppli's estimates show a linear relationship between price and storage capacity. Since practically all rumors have stated 8 GB of storage, the price would be half of the Flash memory in the iPad 2 & new iPad. DRAM - High End Rumors assume 1GB of RAM, just as in the new iPad, while I have assumed 512 MB of RAM for Low End Rumors, with the same price. Display & Touchscreen - This is where it gets interesting. iMore claims that the iPad Mini would have the same resolution as the new iPad, which means that the pixel density on the iPad Mini would be higher. This could actually increase the cost of this component for the same screen size, so I have taken this cost to be roughly 80% of the cost of the display & touchscreen on the new iPad, for the high end iPad Mini. For the low end iPad Mini, I have assumed the same cost as that for the Kindle Fire - While Apple does use higher quality and more expensive components than Amazon, Apple also enjoys greater economies of scale. 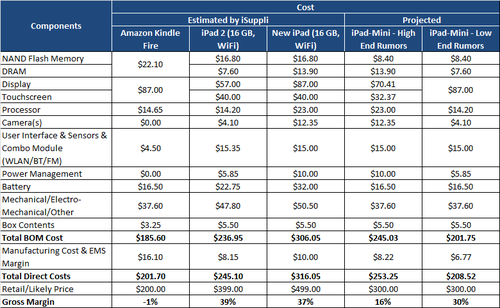 Taking into account the difference in the date of these cost estimates (Kindle Fire BOM is as of Nov 2011), this should be a satisfactory estimate for the lower end of the price band for this component. Processor - The high end iPad Mini would need at least an A5X processor (as in the new iPad) to drive the pixel density of the display, while the low end iPad Mini could do with an A5 processor (as in the iPad 2). Camera & Power Management - I have assumed that new iPad's estimate on the high end iPad Mini and the iPad 2's estimate be on the low end iPad Mini. User Interface, Sensors & Combo Module - I have assumed a flat cost of $15, same as the new iPad and lower than the iPad 2. Battery, Mechanical/Electro-Mechanical/Other - This would include the enclosure, buttons and other external components. I have assumed the same cost as the Kindle Fire. The rationale here is the same as that used for the Display & Touchscreen of the low end iPad Mini. Box Contents - This includes all the add-ons Apple provides with a product (headphones, etc.). Since this seems to be the same across all iPads, I have maintained the same cost. 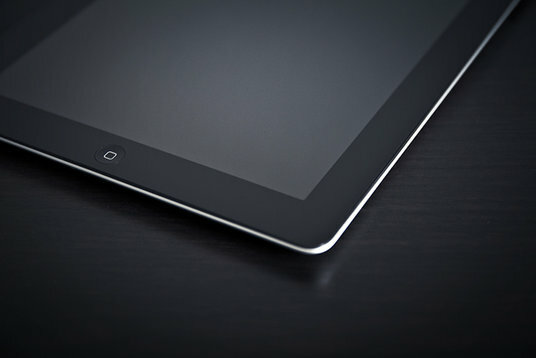 Manufacturing Cost - Manufacturing cost is approximately 3.4% of BOM for both the iPad 2 and the new iPad. I have used this same figure to arrive at the manufacturing cost of the iPad Mini. Price Sensitivity of Components - The BOM estimates of the iPad are as of March 2012, so the only components likely to see any meaningful price reductions are semiconductor components (NAND, DRAM & Processor). But since these components account for just 15-20% of the BOM, it is unlikely to have much of an impact on the total cost. Even a 25-30% drop in price of those components would reduce the total BOM by just 5%. This should be balanced out by the fact that I have assumed the lower end of the potential price band for other components like battery, mechanical, display, etc. Now that we have an idea of how much it costs to build an iPad Mini, what sort of gross margins would Apple make at various price points? Now, as a benchmark to the above figures, the gross margins for the 16GB, Wifi-only models of the new iPad and the iPad 2 are nearly 40%. In fact, these are the lowest margin products among all iPhone & iPad models. Given this fact, it is very unlikely that Apple would drop these margins anywhere south of 30%. iMore's report assumes a $200-$250 for a high end iPad Mini, which would imply a gross margin anywhere between -27% and -1%. I really have to marvel at the kind of fact checking that happens behind the scenes when these reports come out. If an iPad Mini is launched, the most likely model is likely to be similar to the iPad 2 in terms of specifications and at a price point of $300. Apple's stock price has been driven to current levels on the back of strong volume growth of high margin products. 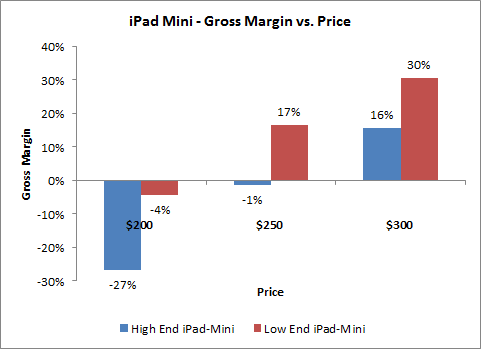 Now, we've understood that the low end iPad Mini gives Apple a gross margin of 30%. Now, since ~40% is already the lowest gross margin Apple makes on its major products, a drop to 30% is a major drop from the perspective of the stock market. In addition to this, Apple is has one of the largest advertising & marketing budgets in the consumer technology industry, in fact Apple spends more on marketing than R&D. In the last quarter, Apple spent 6% of its revenue on Sales, General & Administrative (SG&A) expenses, of which the majority were probably spent on advertising & marketing (my estimate would be 4-5%). These would have to be deducted from the already low gross margin to arrive at the operating margin. This would put even more pressure on Apple's stock price. I've already mentioned before that low priced media tablets are going to make up the largest chunk of the tablet market going forward. This means that the iPad Mini would very likely cannibalize a large proportion of potential iPad sales as well. This fear, in conjunction with what I've mentioned above, would invariably cause a sharp stock price drop the moment this product is announced. Given these implications, is it still a good idea for Apple to go ahead with the launch of an iPad Mini? Absolutely! Apple's current reliance on high margin products for volume is unsustainable and that is the reason for Apple's low valuation multiple. As the father of disruption theory says - proprietary, high-priced models will always be overtaken by low-priced, modular approaches. This would be the first hint of a self-destructive instinct from Apple, which is required for truly sustainable growth. The tablet market is still mostly concentrated in high income demographics in developed economies and among early adopters. With the upcoming launches of numerous low priced but capable tablets, the tablet industry will be going mainstream this year. If Apple doesn't launch an iPad Mini, it will be overtaken by low priced rivals very quickly - my prediction was the fourth quarter of this year. However, the launch of an iPad Mini could extend that window and give Apple a much needed weapon against the threat of lower priced tablet competitors. Conclusion - It is extremely unlikely that the report from iMore is true, given the implications on Apple's gross margins. The most likely product would be a low end iPad Mini, at a $300 price point. Although this would be negative for the short term outlook of Apple's stock, it would be good for its long term prospects. I heard the new iPad mini will allow the user to place calls and will be tentatively called the iPhone. 8 gig is not enough memory for an ipad. There are already complaints abiut 16gig. I agree. But like I said, I was just checking the veracity of these claims. A 16 GB model might not get launched at all, because there's little point of pricing it above $300, when the iPad 2's at $400. It's possible that Apple decides they can't release this product based on these reasons. Anyone who thinks they know what Apple is paying for components is deluding themselves. These BOM projections don't have much to do with reality, just look at what their "estimated" iPad Magins are, 37%! I haven't done the math, but assuming Mac margins are quite a bit lower than that, iPhone margins would have to be high 50s for Gross Margins to be 47.4% across the product lines. Because of carrier subsidies, smartphones generally make higher margins than tablets. And since Apple charges higher carrier subsidies, they make a higher margin. And you need to learn what the word "subsidy" means. Carriers don't pay Apple a "subsidy", they buy iPhones from Apple at a certain price and then re-sell them to their subscribers at a lower amount. The difference between those two prices is the carrier "subsidy." Granted, Apple gets a higher price from carriers for iPhones than other manufacturers do for their handsets, but that's simply a reflection of demand, just ask Sprint. Lol! That's the funniest thing I've ever read. That's exactly what a "subsidy" is and you just stated it yourself. How does it matter whether carriers pay Apple the subsidy "difference" or buy at full price and sell at a lower price? It has the same impact on the bottom line.